This book describes the principles of tongue diagnosis in great detail and is a thorough, clinically-oriented exposition of tongue diagnosis. Each of the major aspects of the tongue (body colour, shape and coating) and its relationship to the diagnostic process is described systematically. 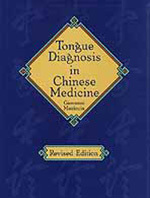 The author also traces the historical development of tongue diagnosis and its role in the evolution of traditional Chinese medical theory and practice. Featured are 59 colour plates selected from the author’s own practice which vividly illustrate many of the types of tongues that are commonly found in the Western clinic. Accompanying the plates are case histories which demonstrate the application of the principles of tongue diagnosis in actual practice. Other aspects of tongue diagnosis newly described in the revised edition include the integration of tongue and pulse diagnosis; the use of the tongue in diagnosing emotional problems; tongue diagnosis and herbal therapy; using the tongue for prognosis; and special considerations regarding tongue diagnosis in children. The appendices provide a summary of the traditional principles governing the identification of disease patterns (Six Stages, Four Levels and Three Burners) and their relationship to tongue characteristics. A glossary of technical terms, bibliography and a detailed index are also included. A thorough, clinically oriented exposition of tongue diagnosis. Will undoubtedly be the standard textbook on tongue diagnosis for many years to come. A clear, precise and accurate description of this important pillar of Chinese medical examination.